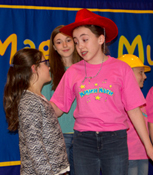 The Magical Music Troupe is composed of 10 - 12 talented performers 3rd – 8th grade who have good voices, move well on stage, and are available to make all rehearsals and alternate performances through June. This group performs A Day in the Life of a Child: Musical Revue and other original Magical Music songs. Rehearsals are held on scheduled Sunday afternoons at The Studio in New Canaan, CT. There is a participation fee for this group to help defray the costs for the director, rehearsal space, sound technician, and other performing expenses. All singers are expected to participate in TUNES IN TIMES SQUARE, our annual May sing-a-thon benefit concert in Times Square, NY, and A Day in the Life of a Child: Musical Revue performances. Over the years, the Magical Music Troupe have performed at venues including the Tribeca Family Festival, TUNES IN TIMES SQUARE, Autism Walk Waterbury, Diabetes Walk New Canaan, United Nations, Giant Steps, The Southport School, Country Childrens Center Katonah, One Town ... One Voice Concerts, New Canaan Nature Fair, Ridgefield, Holiday Stroll, Enchanted Forest, St. Mark's May Fair, and North Salem, & New Canaan Libraries. The Troupe is part of the talent pool used for our recording projects throughout the year. 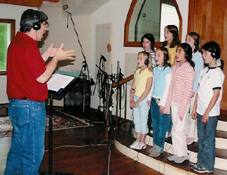 Also, we include other young singing talent as needed for our recordings. If you would like more information about the Troupe and/or our recording projects, please contact the Magical Music office at info@magicalmusic.org.